Use TB88AQ6 to reference this item. Targe was discovered abandoned ashore in a parking lot in Maplewood, Minnesota, United States of America in February of 2017. He was rescued and taken home to recover. Now that he has recovered he wants to see the world's oceans, all five of them. Then, he'd like to return to his owner at a specified time. He wants to stay near water preferably in caches big enough for him to breathe. Keep him moving and safe. If he is sans plastic bag, please provide him one. God speed! 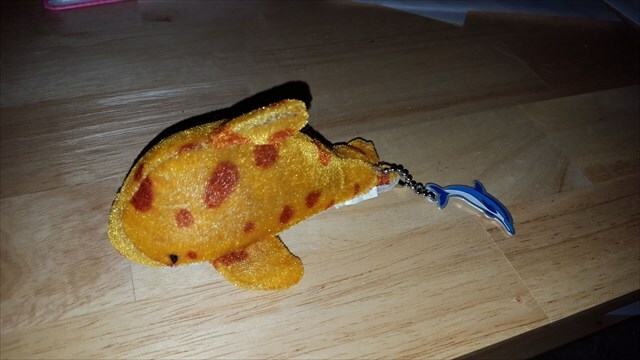 A plush toy dolphin found abandoned in a big box store parking lot. He wants to see the ocean, lakes, streams. Please take pictures of his travels! Handle him with care. Do not pull on the trackable or the toy. Also please please try not to hold onto the trackable for long periods of time. It needs to go swimming and has had bad luck doing so. Dropped this one off at a nearby TB hotel to get it moving again. Picked it up on this cold day. Will move it soon. Still in good shape, safe and dry. Catching up on logging TB's that i have had stored for discovery for WAY too long! This trackable has been discovered by Youtube Vlogger Hakliva! Her adventures can be seen at http://www.youtube.com/hakliva or followed at http://www.facebook.com/hakliva.online and on both instagram and twitter @hakliva on one on my travels either at caches or at events! Thanks for the discovery! Since my trackable is so close to Minnesota, if anyone can bring it to Minneapolis or the twin cities, I would love to see my favorite trackable again. There are several TB hotels in the North metro I could stop by and grab my friend again. If it goes somewhere else thats okay too. Retrieved this guy from The Pink Flamingo TB Hotel.